When Paul Shapiro took his first bite of clean meat in 2014, more humans had gone into space than had eaten real meat grown outside an animal. In addition to being among the world’s first clean meat consumers, Paul is a four-time TEDx speaker, the co-host of the Business for Good Podcast, the CEO of The Better Meat Co., and longtime leader in food sustainability. He’s published hundreds of articles in publications ranging from daily newspapers to academic journals. Paul lives in Sacramento, California with his wife Toni Okamoto, author and founder of Plant-Based on a Budget. His first book, Clean Meat, is a Washington Post bestseller, and has been translated into numerous other languages. You can read more about Paul’s work and contact him at Paul-Shapiro.com. “Paul Shapiro provides a fascinating look at the future of food and the innovators who are working to interrupt and reinvent the food system. 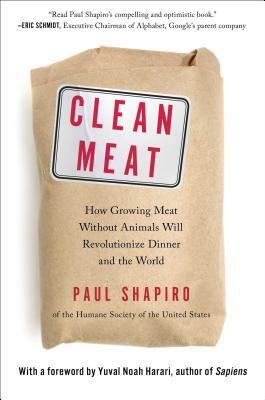 Clean Meat is an interesting and worthwhile read." "Clean Meat offers an inspirational look into a future where the cellular agricultural revolution helps lower rates of foodborne illness, greatly improves environmental sustainability, and allows us to continue to enjoy the food we love." "An interesting and controversial glimpse into how cellular agriculture may supplement conventional agriculture and how innovation offers a variety of additional ways to feed a hungry and growing world." "Paul Shapiro has written a timely and informative book on the exciting transformation that is about to happen in the way we produce our food. He introduces us to the bold young innovators and entrepreneurs who are developing clean meat, milk and eggs. What they are doing has the potential to put an end to a vast quantity of cruelty, and to make a dramatic reduction in greenhouse gas emissions." "A brisk and engaging case, "Clean Meat" advocates without overselling."